At this moment Rome is hosting the International Congress of Classical Archaeology. As a consequence, we have been receiving distinguished academic visitors on site, the most enthusiastic being Professor Janet Delaine, of Oxford University, who has made two trips to visit us and has been able to advise Axel, who is busy studying the mortars of the site, in order to improve our knowledge of the phasing of the buildings. She has encouraged us to understand the subsidence of the plaza (and thus the preservation of some sections until today) in terms of the structures found underneath – in the bath building buried below. 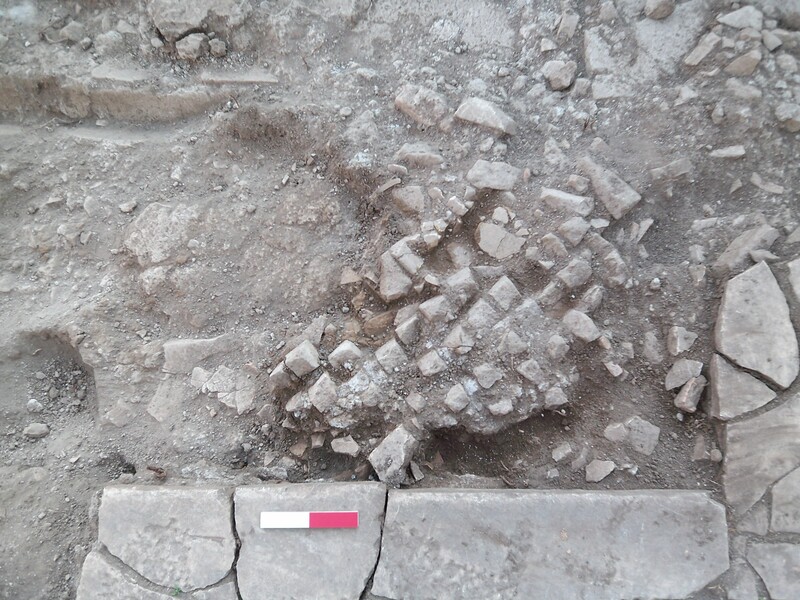 We have come up with the theory that one deeply subsided area may have been set over a hypocaust which collapsed, taking the paving with it. It thus required levelling, with building rubble thrown in to fill the hole.